– Fixed critical bug where, in certain circumstances the profile selector would choose the wrong profile slot. – Fixed bug where player would be invisible when entering certain challenge rooms with stereo-blindness. NOTE: This is a very small patch update that addresses a critical save bug. Because of its size, we are providing a link to a patch updater instead of a full installer, however v1.2.0a must be installed first. Although the bug is quite rare (we have yet to have anyone report it), it causes problems with save data, so it is recommended to update to this version as soon as possible. We apologize for all the trouble. – Fixed longstanding bug where, in rare occasions, the data for treasure chest placements would desync, resulting in regular chests looking like fairy chests, and some chests randomly closing and opening. This fix will only work with new castles. Players with already corrupted maps will need to generate a new one. – Disabled map in challenge rooms. – Fixed bug where you could get dementia in challenge rooms. – Fixed bug where compass room entrances could appear in challenge rooms. – Fixed bug where pausing/resuming the game with Time Stop active would reactivate projectile logic. – Fixed bug where the first phase of the last boss could get stuck on platforms. – Fixed bug where entering the Alexander challenge room while a dwarf or giant would result in keeping those sizes after translocating. – Fixed bug where Herodotus battle would sometimes fail to end after defeating him. – Fixed bug where challenge rooms would appear on the game map. – Fixed graphic bug in one of the new rooms. Patch v1.2.0 has been released! More content, fixes, balances, and optimization tweaks incoming! The following patch includes a content update along with the bug fixes and balance changes that usually accompany it. We are also currently testing Steam cloud support (Steam only) and will be rolling it out once we’re confident in its stability. – Added 5 boss remixes to the game. – Added 1 new class. – Added 4 new traits. – Added 28 new rooms. – Added ability to reduce shader effect quality for people playing on slower machines. – Added 6 new Steam achievements (Steam only). – Added a small winter effect. – Fixed a few spelling mistakes. – Fixed bug where you could cast spells in carnival rooms and destroy targets before the game starts. – Fixed bug where talking to Pooyan with a spell/ability that drains mana active would result in constant mana loss. – Fixed bug where completed chests would sometimes show incorrect objectives. – Enemy names in the enemy HUD now have a character cap. – Fixed bug where open chests would not be properly reflected on the minimap. – Fixed bug where diary rooms would show an exclamation mark even if no diary entry was available. – Fixed longstanding bug where some enemies would spawn well above or inside terrain. – Fixed bug where the introduction cutscene would crash in very rare cases. – Fixed bug where casting certain abilities (translocation, assassin ability, etc.) right before entering the castle would result in undesired effects. – Fixed bug where version 1 of the last boss could not be hit when casting a certain spell. – Mana cost for spells with no mana cost is no longer displayed. – Fixed bug where the lineage screen was giving the wrong helmet to ancestors. – Fixed bug where different sized characters (gigantism, dwarfism, etc.) were not being displayed properly in the credits or profile card. – Fixed bug where player could move while the last boss door was opening. – Fixed bug where you could crash the game if you pressed two directions at the same time in the diary entry room (only possible with keyboard). – Diary entry rooms are now removed from the castle’s generation if you have obtained all possible diary entries. – Vampire and siphon runes now scale with NG+ level. – Chance of gold chests to drop random stats instead of gold has been significantly increased. – Increased visibility in dungeons to make navigation a little easier. – Ponce De Leon logic tweaked. – Expert Eyeball fire spread reduced from 6 to 4. – Adv.Eyeballs fire spread reduced from 5 to 4. – Map tweak to Barrel platform room. – Fixed plant miniboss sometimes spawning on ground. – Odds of farting when having IBS lowered. – Herodotus HP reduced slightly. – Spelunkers Light no longer costs mana. – Bouncy Spike auto kill logic bug fix to reduce false positives. — Fairy Basic, Adv. and Exp. — Plant Adv. and Exp. — Fireball Adv. and Exp. — Portrait Adv and Exp. — Horses Adv. and Exp. 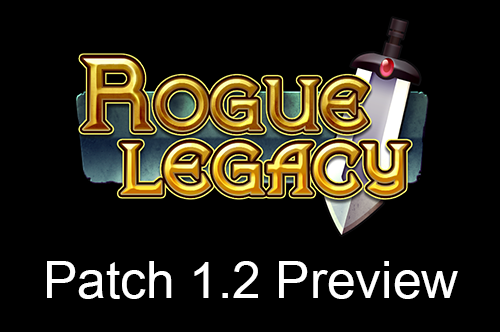 Patch 1.2 of Rogue Legacy should be coming out in the next few days. We’ll have more detailed notes when it gets released, but for now we thought we’d give you a quick look into the content we’ll be adding into the game. – 5 new bosses will be available to battle. These battles will be true tests of skills, and should be available to people at all parts of the game. These are not casual battles, and only the best will succeed. – A new secret class can be unlocked by players. It’s pretty uber. – 3 New traits will be added to the game to add some extra variety to character generation. – The map pool has been increased by 10% to add a touch more variety to your game. – General balance tweaks and modifications to the game logic to make everything a little smoother. – Also the Haggle skill will now actually be useful.